Moon bingo seems to have been popular with bingo players since day one, its commitment to players, site design and offers has kept the site looking and feeling fresh. A combination of quirky features and a generous sign up bonus draws players in, but there are even more reasons to remain a player at Moon bingo as they have become very good at what they do. There is a glorious moon glow shining brightly in the night sky and a quick reminder that it is Bingo time! Moon Bingo is an out of this world bingo portal that will have you doing the moon walk. It is said that the full moon has a great effect on our moods and without a doubt Moon Bingo will have a huge effect on you every time you play. The theme is based on the moon with suited up astronauts that have just landed. Land yourself in your comfortable chair where registration is made easy by filling out a simple form. And like the moons gravitational pull you will be launched straight to Moon Bingo. The Latest Winners will pop the cork on your champagne with astounding wins. What is even more impressive is the daily totals of the cash winners. It is evident that winning is not unusual at Champagne Bingo. Moon Bingo is launched by Dragonfish, a leader for developing dynamic online games and a household name among players. They belong to the B2B Division of 888 Holdings and are partnered with a successful team of professional developers. They are fully licensed to operate online by the Government of Gibraltar and is owned by Cassava Enterprises. 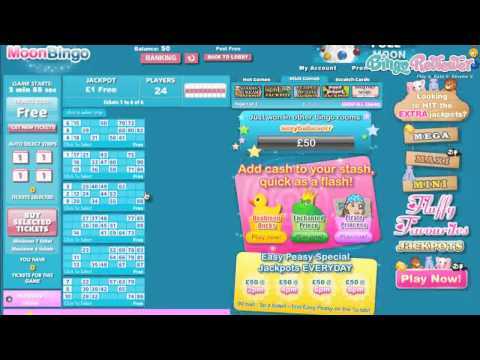 At Moon Bingo getting started is easy through Instant Play creating a fast and quick access to all their games. UK’s popular 90 ball bingo with three ways to win and American 75 ball bingo with tons of patterns are available. Ever play bingo and worry you might have missed a number and a chance to bingo? You won’t have to worry in these bingo rooms because everything is automatically done for you including the dabbing of cards and announcing the winners. If you have ever looked for a quick way to win a fortune on Bingo, now is your chance. Play the £1,000,000 Bingo Cover all game; it could just be the next millionaire. It is a chance worth taking and the next winner could very well be you. The Slots are truly amazing with graphics that are stunning and animation that is riveting. Special Features add bigger wins with Bonus Games, Free Spins, Wild symbols and Scatter wins. Promotions are key to an online bingo site and players are in for a special treat at Moon Bingo with substantial offers that are available every day of the week. New players and existing players will have an array of Deposit Bonuses to maximize their gaming. Get your Daily Dosh with £2,000 in cash prizes given away a day! Take advantage of this great offer while playing absolutely Free. Play in the Dosh Games with nothing to risk and everything to gain. Happy Hour takes place every day from 11:30am to 10:30pm and offers Guaranteed Jackpots in the bingo rooms. Unlike other Happy Hours who only give you an hour or two, Moon Bingo beams fantastic with long hours of happiness. Earn Moon Points every time you play and convert them into real cash. To starting collecting your points play, play, play in your favorite bingo rooms and watch them stack up in a hurry. Moon Bingo has an incredible theme and a stellar web design. The Daily Dosh Free Games and Moon Points offer ways to earn real cash prizes. We rate Champagne Bingo with 4.75 Pink Hearts. It's so nice to use a bingo site that isn't completely pink everywhere! I like Moon bingo as trhey always have a lot going on, and daily incentives. I think that their jackpot Super Millionaire game as well is one of the biggest out there. The promotions is one really attractive draw for me and i think it helps get more people into the games as well. And that makes the chat friendlier! I really like the graphics on this site and nothing too overtly girly or feminine. But that dancing bingo ball is really scary. Great overall experience at Moon. You just have to try it to see what I mean! The old site had a design that was really good. But I do agree that they've made it better. I particularly love the chat games that they have here. 300% on your first deposit, I think that tops most sites that offer only 250% But that is not the only great thing about Moon, the games that they have also adds to the equation! Had a great day today and won more than 300 quids on moon, so i'm giving them all 5! They deserve it too! I like the whole moon concept of this bingo site. I especially like for 25p i have a chance to be a millionaire. Yes this is a great site. they got some cool TV Adverts . You might want to check the Vid's section we got. I don't like when these bingo sites refer to a deposit bonus as anything but. 30 free is misleading when I am required to deposit first. This is one of my favorite sites to play at! They offer a ton of great games and promotions. What really attracted me to this site was their welcome offer. As a brand new player, they get you started with four full days of absolutely free bingo, with no deposit necessary. As soon as you join, all you have to do is head to the Newbies room from 11am to 7pm, to redeem your offer and win real cash Jackpots! They also have a feel free room with what seems like non-stop free games. On top of that, the Daily Dosh room is also open to every player who has funded £10 that day, for the opportunity to play for nothing! PLUS, VIP members get even more access to free bingo. It’s really crazy how much free opportunities they offer. They also have really cool promotions going on all the time to keep things fresh and interesting. Shoot for the moon at Moon Bingo by trying your luck at the jackpot games where you can have a chance to win up to 1 million pounds. There aren't a lot of sites with this kind of serious money being offered. You get your start at Moon Bingo by signing up and playing four whole days of free bingo. That's not all the free bingo you'll get either, they have free games going on almost all the time. And don't worry about your information being used inappropriately here. With the well-known Dragonfish software driving the site, your information is safe and secure and so are your financial transactions. There are always new and abundant promotions going on at Moon Bingo so be sure and check them out regularly. Join their loyalty program for more bonus capabilities. Deposit and get some great bonus money to increase your play time. Entertainment is at your fingertips with bingo games, slots, casino games, scratch cards and instant win games offered to all members who play at Moon Bingo. If you decide to become a VIP you will reap tons of rewards like cash back and special bonuses. All in all a great site to play and have fun with while you enjoy your bingo fix. Good luck playing at Moon Bingo! They give you tons of awesome deals here. When it comes to starting you off as a new player, the give you two separate welcome bonuses to begin playing with. If you sign up and make an initial deposit of £10, they will go ahead and triple your deposit, giving you a total of £40 to play with. Right away, you can enjoy many of their games for virtually free with the bonus cash that they award you with upon your first deposit. In addition to this great offer, they also award new players with four days of totally free bingo. They’re all about the promotions here! They have so many to take advantage of on a daily basis! Before you know it, you’ll be raking in the cash based on promotions alone! One of my favorites is their payday bingo. You can win some serious cash by playing for a chance to win with this promo. They’ve got tons of free bingo opportunities and other great deals as well. Most of the Dragonfish sites are really similar to each other, almost the same games and bonuses, and that's a bad thing. The good thing is that it is still among the best out there, the games are simply stunning and pay rate usually works out just fine. This site keeps all the good stuff, adding a few things just to spice it up. You get to start with a 200% first deposit bonus (yup, no free no deposit bonus here), and a free Bingo room opened for 48h from your registration (it is ideal for newbies). Also, there is a 3ree 4 Free room, that you can access 3 days after registration, with £2,000 jackpot every night (£50 guaranteed). I was a bit surprised to see they only have 75 and 90 ball games to offer, since Dragonfish is well known for the high5 bingo, but I guess they will add it, eventually. New players, min dep £10. £60 bingo tix + 20 Spins on Starburst. [wins capped at £5, WR: 85 x(bonus)]; 8 tix to "£2,500 Real Cash" (real cash wins). 20 tix to "£50 Daily Treat”: [WR: (4 x bingo bonus)]. Games Bonus wins cap: £400 + the initial bonus amount. Deposit balance can be withdrawn at any time. Wagering restrictions & T&Cs apply.